The pressure will be on. The challenge for Nickel & Nickel will be to make wine that can measure up to their resplendent winery Nolan Construction is now building for them in Oakville. This is an exquisite showplace. 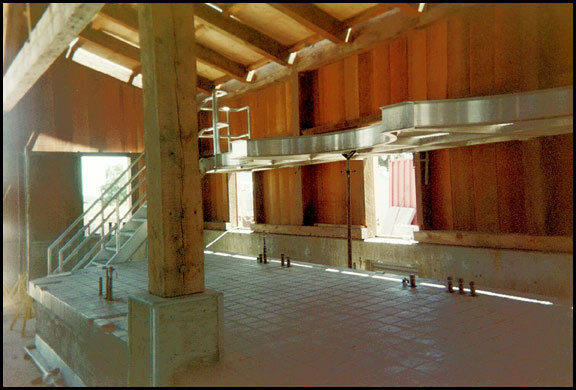 Starting with the exposed old growth fir beams attached with oak pegs in mortise & tenon fashion with vertical cedar siding inside the winery. All of the utilities including electrical lines and process plumbing lines are hidden from the eye, behind walls, under tank pads, below floors and above ceilings. And that is saying something considering that LeDuc & Dexter has installed over 3 miles of copper piping and 10 miles of radiant cooling PEX lines plus numerous manifolds with circuit setters, gas, glycol and air lines that are serviceable from behind stainless steel cabinet doors that sit within notched enclosures in the pre-cast cement columns that grow out of the basement barrel room. Get the picture? Let us not forget the basement barrel room décor with its cathedral-like plaster soffit-style ceiling that conceals the copper piping with its expansion loops coming off the boiler and chiller pack cooling lines and return lines that disappear behind a wall to their source valves and meters. Seriously, if you don’t look fast and look right now you wouldn’t believe that LeDuc & Dexter have done close to one million dollars of work here on this design/build project. We will revisit Nickel & Nickel and Nolan Construction, the General Contractor who are building a winery that will certainly compliment and perhaps rival the wine they will make here.